This time I have decided to do something a bit different and so instead of hitting the streets as I usually do, I have visited the large beach of Rethymno, my home town here in Crete and made some photos there. I made this video in mid August when the sun was scorching hot. There was lots of bright sunlight! So bright in fact that I couldn’t walk outside without a hat and sunglasses on. 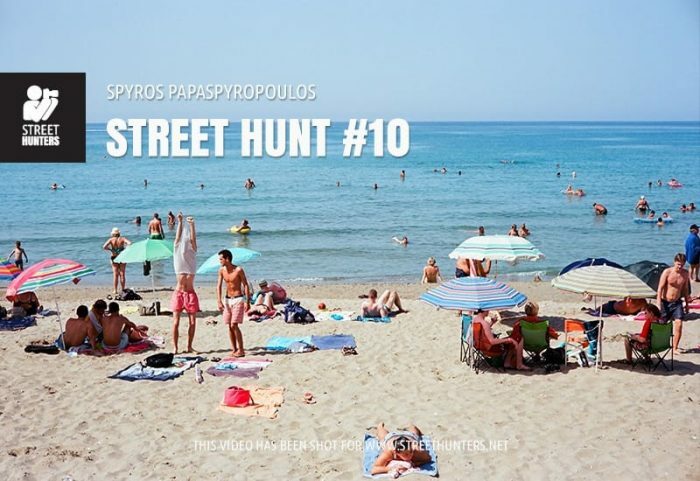 As you will see in the Street Hunt No 10 I start my walk from one end of the beach and walk all the way to the where the actual street ends, about 2.5 km to the east. During my walk this time I use a film camera again. This time I use the legendary Yashica Electro 35 GTN, the model that most photographers consider the flagship Electro amongst all the versions that were ever released. Yashica guy explains everything you need to know about the Yashica Electro 35 GTN if you are interested in reading more about this amazing camera. The concept behind this Street Hunt is to share with you each and every shot on the roll I used. A roll has 36 shots but I managed to get 37 or 38! You will notice that the experience is different to that of my digital camera. The shutter sound of the film camera is very, very silent. You can hear the manual winder cranking but sometimes the shutter release is inaudible! A perfect tool for Street Photography! So, as I mentioned before in this Street Photography video Tutorial I use a Yashica Electro 35 rangefinder camera, specifically the GTN model. The GTN model is about the size of a Fuji X-Pro1. It offers a shutter speed up to 1/500th of a second and supports up to 1000 ASA (ISO) film. It is equipped with a fixed 45mm f1.7 manual focusing lens that is extremely sharp! My selection of film this time is the amazingly vibrant Kodak Ektar 100 finest grain negative colour film! What an amazing emulsion this is! I think it might be my all time favourite negative colour film. The colours just pop! I have shot the film slightly over exposed by setting my ASA (ISO) to 80 instead of 100. A tip given to me by Romeo D, a film expert StreetHunters.net Reader. Cheers Romeo D! Love the results! During this Street Hunt I use different methods to focus manually. I use the focus ring to manually focus on a subject using the rangefinder, I use pre-focusing, zone focusing and hyperfocal distance. You can read more about zone focusing and hyperfocal distance in last week’s featured post. I have added annotations in the video to make sure that I properly communicate to you what I am trying to convey through my descriptions and actions. So, lay back, relax, grab something that makes you feel comfortable, something like a refreshment or a snack and enjoy this month’s Beach Street Hunt! Thanks for your comment Klaus! Aren’t those Ektar 100 colours something? I really love them! Enjoyed the video Spyros…..sure looked warm out there!! Hi Keith and thanks for your comment. It was super hot that day! I think I must have got a mild sun stroke after I made the video. The temperature was 36 celsius and I remember it precisely.